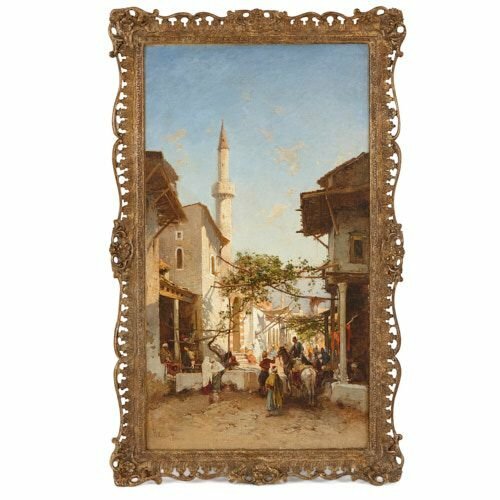 This vibrant and charming oil on canvas painting of a Middle Eastern market has been skilfully painted using and short, well-blended strokes of colour. The artist of this fine composition, Hermann David Salomon Corrodi, was famous for his paintings of landscapes and Orientalist subjects. 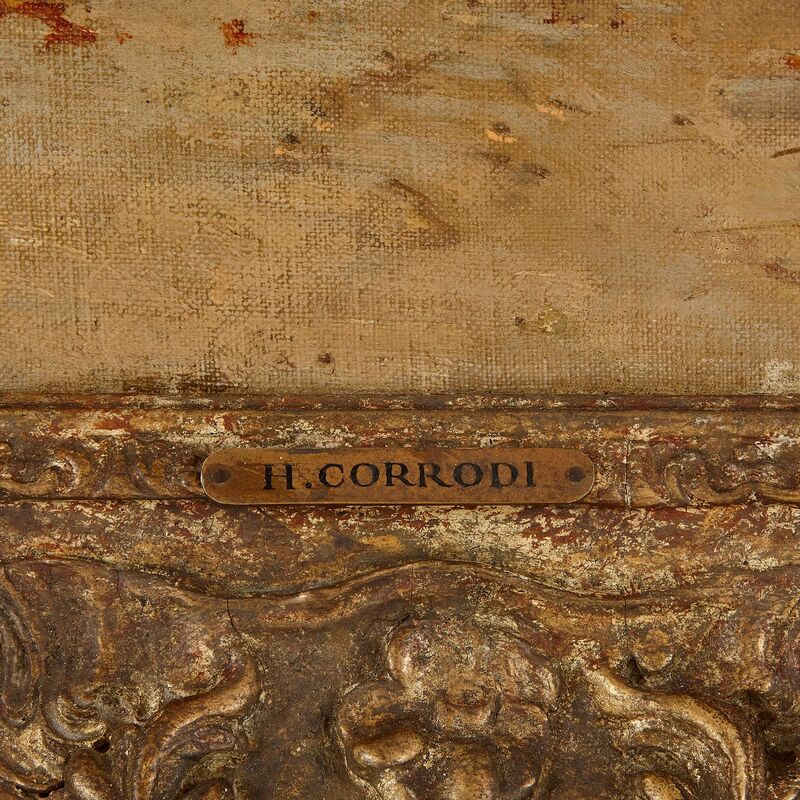 Corrodi studied at the prestigious Academy of St Luke in Rome, and later in Paris. 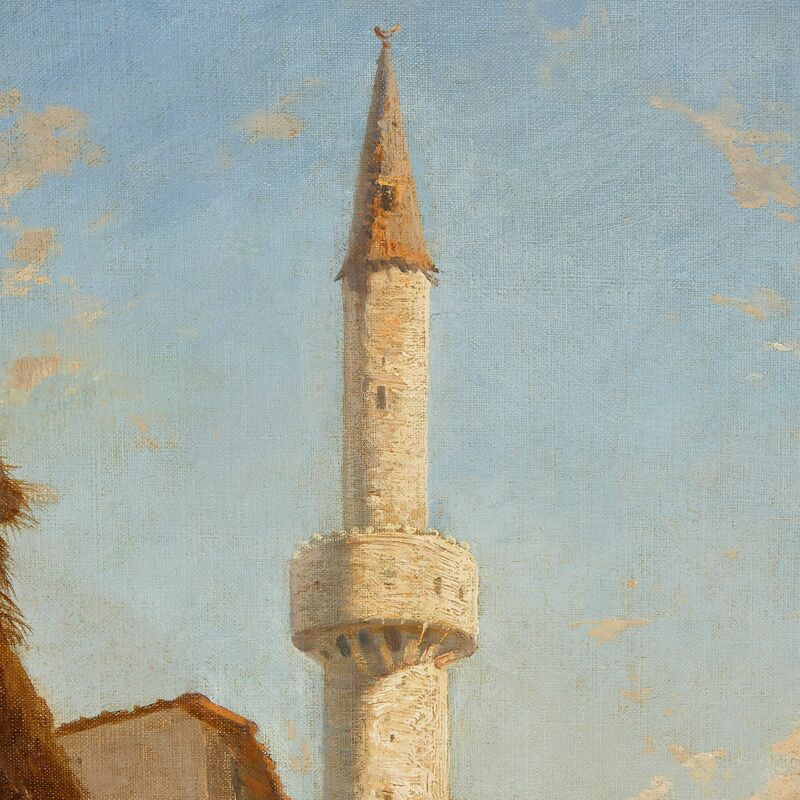 His travels to Egypt, Syria, Cyprus and Istanbul, provided him with a wealth of material to use in his paintings. Corrodi was well-respected in his lifetime, and was well-acquainted with several European monarchs, including Queen Victoria of the United Kingdom and Ireland. 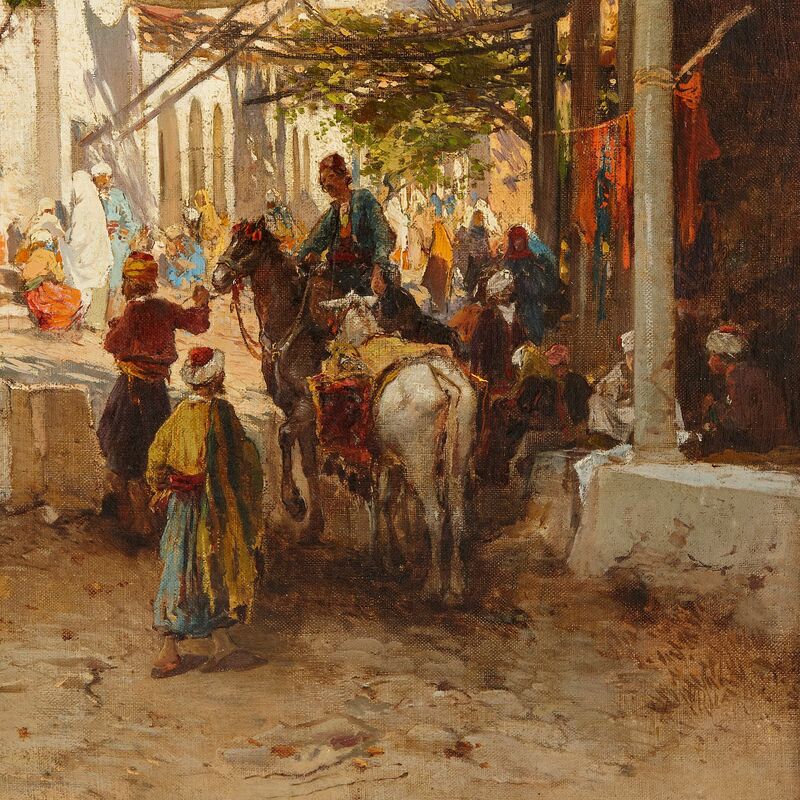 The painting depicts a market scene, which takes place in a narrow street, under the cover of tree branches, which are propped up between the two rows of buildings. Groups of people gather in the shade under the beams of the buildings, which are old and relatively run-down. Clusters of women wearing white burkas and men in turbans and colourful clothing stand and talk, or bargain, in the street market. One man, to the centre-right of the composition, rides a grey horse, and is accompanied by a white donkey, which carries bags of goods. The scene is full of colour and activity. 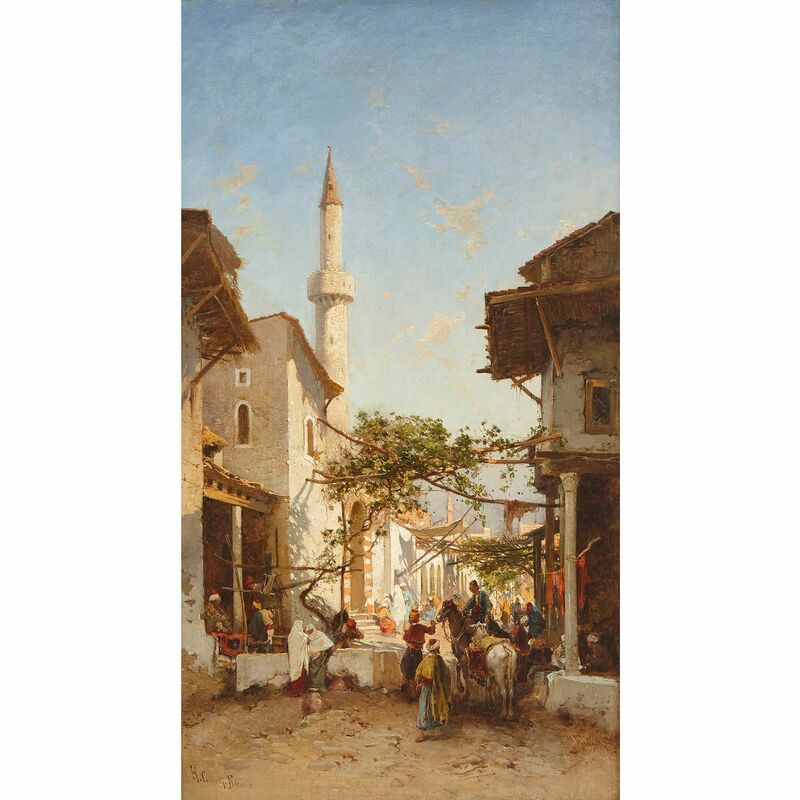 It is possible the market takes place in a village, town or city in Egypt, possibly even Cairo. The 'ablaq' masonry — that is, the stripes of ashlar stone and orange baked brick — on the mosque facade, positioned on the left-hand side of the street, is characteristic of Egyptian, medieval Mamluk architecture. The mosque's single minaret extends up above the height of the neighbouring street buildings. The artist, and viewer, occupies a more open space before the street, possibly a square. In this way, we observe the scene from a distance. 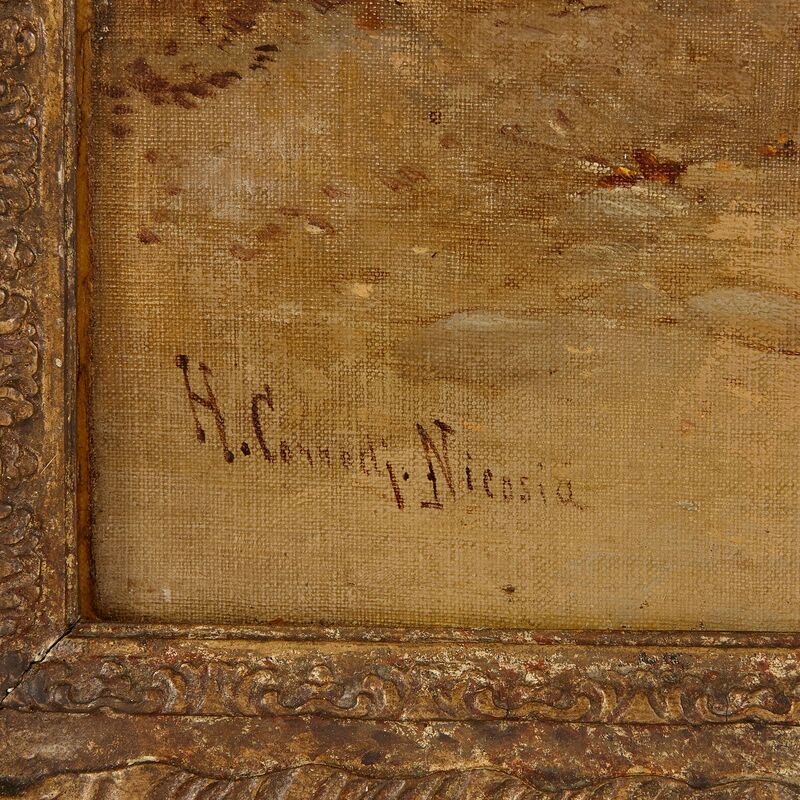 Corrodi has painted this image with great skill. He has employed short brushstrokes, which has allowed him to capture every detail of the scene. For instance, the details of the cracked white plaster walls, the clothes-line delicately suspended from a classical Corinthian column, and the shadows cast by tree branches are quite exceptional. 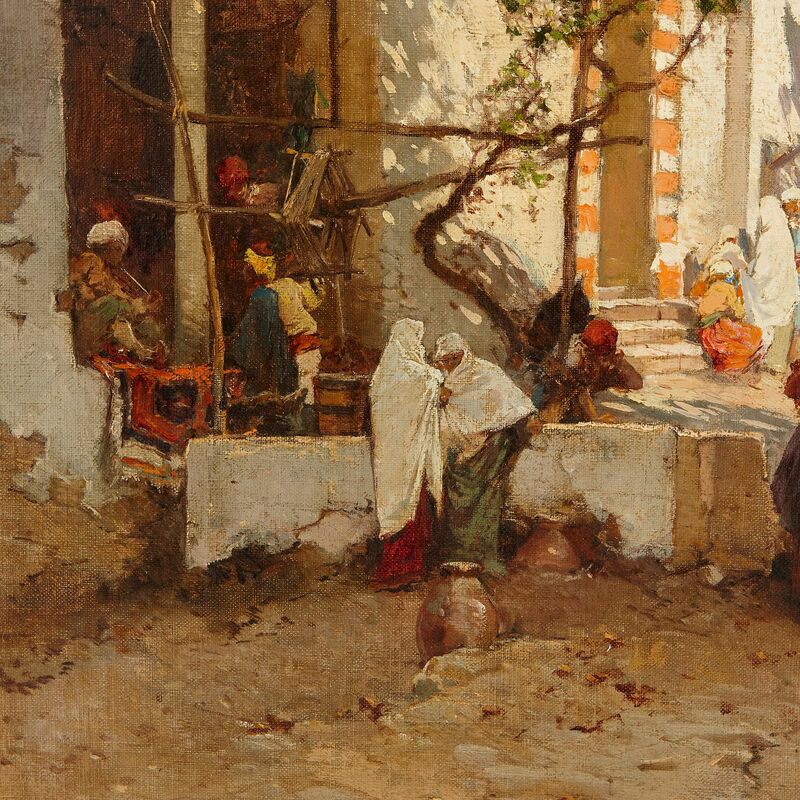 The scene is bathed in a warm light, giving the impression of a hot Middle Eastern day.